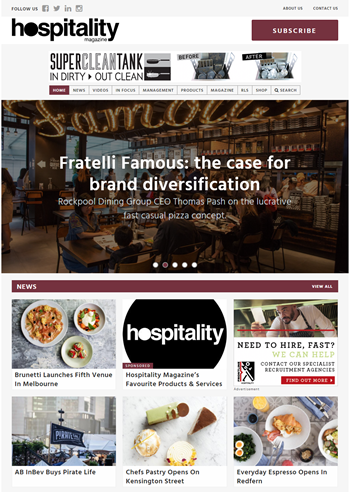 Hospitalitymagazine.com.au is the online arm of Hospitality magazine. Updated daily, the site keeps hospitality professionals informed of the latest news and trends, as well as offering essential business advice and tips. All stories are archived and are fully searchable by keyword searches. GoHospitality.com.au gohospitality.com.au is an online directory for Australia’s hospitality sector. It provides a comprehensive central online source containing the latest product, supplier and industry news updates.